NASA is developing a robot that could go where no robot has gone before: over and under difficult terrain on Mars or another planet. A NASA video (below) shows how it’s done: The robot can fold into itself to squeeze underneath short obstacles or use its tailfin as leverage to propel itself up and over them. And it could last a long time because it has solar panels on its underside so it can recharge. PUFFER wouldn’t go on a solo journey to Mars, but would be a teammate that could tag in when a larger rover faces a topographical blockade. It could also potentially be deployed, on its own or in a whole troop of PUFFERS, to maximize the amount of work the traveling machines are doing while exploring another planet, Mars being the primary target. So far PUFFER has tested well on a couple of wildly different places on Earth: in the Mojave Desert and the Mt. Erebus volcano in Antarctica. The former is often used for Mars-related research because of its similarity to terrain on Mars. It wouldn’t be the first robot sent to Mars to collect samples and make observations. Of the previous ones sent to the Red Planet, Curiosity is still operating there, learning about the geology and environment of Earth’s neighbor and searching for clues about alien life. 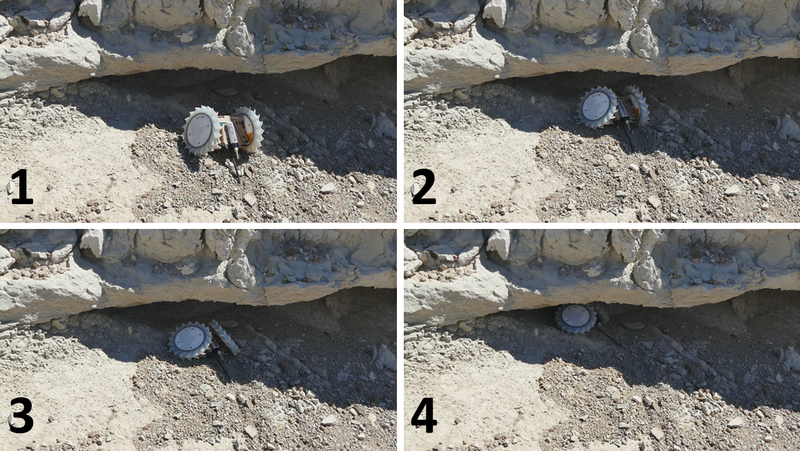 Curiosity is much larger than PUFFER, with six wheels that are almost 1.5 feet wide.